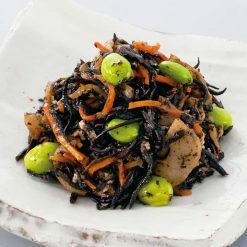 This lightly-seasoned stewed item is made with edamame, carrots, and natural hijiki seaweed, and is delightfully colorful. Gomoku-ni means “five item stew,” and so is frequently made with approximately five different main ingredients. Our gomoku-ni is made with chikuwa, chicken, and and aburaage along with the edamame, carrots, and dried natural hijiki seaweed (chikuwa is a steamed or broiled tube-shaped fish product, and aburaage is essentially fried tofu). This healthy item is low-calorie and contains lots of calcium. It is made with katsuo (oceanic bonito) dashi soup stock and seasoned lightly, showcasing the flavors of the main ingredients. It can be time-consuming to assemble and cook all the components of gomoku-ni from scratch, but because our gomoku-ni comes pre-assembled and frozen it can be ready in mere minutes; with no need to worry about its perishable components such as the chikuwa and chicken spoiling! Without defrosting the gomoku-ni, use scissors to make a cut in the end of the bag for air to escape; then place in the microwave.Approximate cooking times: 2 minutes in a 500W microwave, or 1 minute 30 seconds in a 600W microwave.Gomoku-ni makes a great appetizer or side dish, and is a delicious way to introduce seaweed to those who may not have eaten it before! 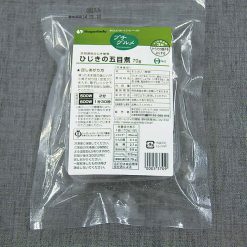 This product contains hijiki seaweed (South Korea), edamame (China), chikuwa, chicken (Brazil), carrots (China), aburaage, soy sauce (contains wheat), refined sake, sugar, flavor (katsuobushi, kombu seaweed).. Origin of ingredients: hijiki seaweed (South Korea), edamame (China). Prepared and packaged in Japan.